Discussion in 'Classifieds' started by vtac, Oct 6, 2011. To make things easier I've separated this into rules and guidelines. Breaking the rules will result in a warning, ban, and/or removal of classifieds privileges. Commonly broken rules are in red. The Forum Rules are in full effect here. Make sure you understand them. Only vaporizers and related accessories may be sold in this section. If you're unsure that your item qualifies, ask a staff member first. To avoid confusion, 'traditional' ecigs are not to be sold here unless approval is given. This section is the only public area on the forum where you can mention that you have (or may have) items for sale or trade. It is also the only public area where you can request to buy items. If you would like to direct a member to a classified ad please use the private conversation system. You may not use a listing here to direct members to an eBay or other off-site sale. This section is provided as a service for members to exchange unused or unwanted items. It is not a place to sell items above retail value for a profit or to unload a large surplus. Use of the Classifieds is a privilege which may be revoked at staff discretion in the event of misuse. Brokering is not allowed. You may not buy or sell for anyone but yourself. You must attach at least 1 picture of any item you're selling/trading/offering beside a piece of paper with your FC username written on it. If you are offering an item for sale that is still factory-sealed, you must include a picture of the receipt, with any personal information redacted. When your transaction has been successfully completed, you must lock your thread. Do this by clicking the Lock link located near the bottom of the first post in the thread. You must be an actively contributing member with at least 60 days membership, 50 posts, and 25 "likes" received to create a thread in the Classifieds. The system checks for eligibility at 20 minutes past each hour. Members who make low-content posts for the sake of increasing their post count may lose the privilege of using the Classifieds section. State the condition of the item(s) you are trying to sell, trade, or buy. Don't use an abundance of caps or symbols in your title. Replies to classified ads are now disabled. See post #6 for more information. To start a private conversation with a member, click their avatar and then click "Start a Conversation" on the overlay. Or, from the member's profile page, click the Information tab and then click "Start a Conversation". Please ensure that you do not post on their public profile section by mistake. The forum takes no responsibility for any transactions that take place here. Participating in the Classifieds section is done entirely at your own risk. PayPal is generally a safe bet for sending/receiving money. See guidelines below. Other safe money transactions include escrow.com mailing a bank check, cashier's check, or money order. This may take a couple days, but you will have a record of the transaction. Confirming the full name, address and phone number of the other party is a good idea before making a transaction. Make sure items are 100% clean before shipping. See: how to clean your vaporizer. To protect your privacy it is recommended that you remove meta data from your photos before posting. Do not evade the PayPal fee by using the 'Pay as a Gift' option. If you do you will have no recourse if the seller defaults. Pay the extra fee so you have protection instead of risking all your money. Don't use the word 'vaporizer' or any other potential paraphernalia terms in any PayPal transaction. 'Aromatherapy device' may be a better choice. PayPal has been known to close accounts when they decide they don't like a word/item. PayPal extends more seller protections when selling to a buyer with a confirmed address. Select the appropriate thread prefix when creating a thread; if you're selling an item, use the "For Sale" prefix. If you have shipping constraints which may limit the sale of your item to a certain area, please make a note of it. Threads with items unsold for 90 days will be closed. Whisper, withoutbliss, Boden and 10 others like this. t-dub, lovecrush, tripwire and 2 others like this. lovecrush, tripwire, Kosmic22 and 2 others like this. "Likes" requirement added to classifieds promotion. Nexx9, elykpeace, lovecrush and 9 others like this. 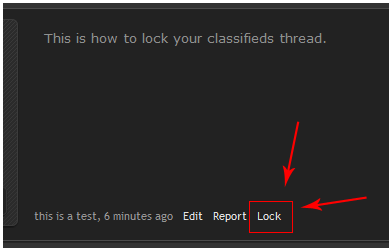 Update: You now have the ability to lock your classifieds thread. This is now the requirement instead of reporting the thread when your item is sold/found/etc. The Lock link is located near the bottom of the first post, as shown in the image below. dynospec, lovecrush, Kosmic22 and 17 others like this. The classifieds section here at fc has come a long way from its humble beginnings as a single thread to a dedicated forum with well over 1000 transactions. Throughout the years the rules have evolved to ensure a useful and safe experience for members while keeping things manageable behind the scenes. After many hours of consideration, we are rolling out some relatively big changes to help streamline the system for everyone. Much of the required staff intervention in the classifieds section (sometimes even forum wide) is a result of replies to classifieds threads. Requiring that transaction related communication takes place through Private Conversations will go a long way to helping the system run smoothly, especially as it grows. For a long time I was hesitant to kill the sometimes meaningful discussions that take place in classifieds threads, however I think it's clear that keeping things clean and lean is a more important priority. Vaporizer discussions belong in their own sections anyway, and it makes sense that private transactions take place in private. Based on these changes we're also removing the "no OBO" rule. If a member constantly sends you lowball offers you can leave the conversation(s) and use the ignore feature. If you see a listing that breaks the classifieds rules, please report it. With the newly available edit history feature, we can indefinitely extend the post edit time window in the classifieds section. If you want to add/update information or answer questions you've been asked about your listing you can edit your OP including the title. You can still make separate threads if desired. I'll be updating the classifieds rules to reflect these changes. Please make sure that you're up to speed with everything. If you have any questions, feel free to make a thread in the Community Discussion section. Thanks for reading, and here's to many more successful transactions! lovecrush, Kosmic22, Zangano Cruel and 19 others like this. t-dub, lovecrush, 063_XOBX and 8 others like this. Added instructions on how to start a private conversation. UnevenPizza, lovecrush, jambandphan03 and 3 others like this.